Many attempts at personal flight have been made over the years by people such as Leonardo DiVinci, Otto Lillienthal, the Wright Brothers, Octave Chanute, Sir George Cayley, and others, but until recent years they have met with limited success. With modern materials and designs, now soaring like a bird is a dream each one of us can easily attain. Foot launched flight came into its own in the early 1970s with the invention of the Rogallo wing. Prior to this, "hang gliders" were homemade affairs that predominately looked like the Wright Brothers' early craft. Two Australians, Bill Moyes and Bill Bennett, were the first to employ the Rogallo wing. They had been towing pentagonal flat kites behind boats for water-ski shows and were looking for something that was easier and safer to tow when they heard about Francis Rogallo's invention. Needless to say, it worked well and they did away with the flat kites. Moyes and Bennett's boat driver, Dave Kilbourne, had the idea that if he built a slightly larger one he might be able to run it down the hill and get it airborne. His first attempt at Coyote Hills here in the San Francisco Bay Area was successful and because the Rogallo Wing was easy to build, transport and assemble to fly, soon people were making their own, selling plans, kits, and finished gliders. The rest is history, as they say, and modern hang gliders are capable of climbing thousands of feet in a single thermal and in the hands of a skilled pilot going a hundred or more miles cross country. By the late 1970s and early 1980s, hang gliding was well established around the world. The traditional hang glider worked very well, but weighed 70 or more pounds, was about 20 feet long and consequently required special racks for your car and a garage to store it in. Some pilots in England and other parts of Europe weren't satisfied with this and since man's very nature is always looking to improve things and make them easier, they started to look for a better way. The answer came from the sports of sky diving and parascending (towing a skydiving canopy aloft, then releasing and flying back down). In the late 1970s three Frenchmen, Didier Favre, Laurent de Kalbermatten, and Freddie Keller, were launching their skydiving canopies off the French Alps. Since it was easier to learn, weighed only 15 lbs and fit into a backpack for transport and storage, the sport grew even faster than hang gliding did in the early 1970s. Today there are dozens of manufacturers and over 200,000 licensed pilots in Europe, over 50,000 pilots in Japan and pilots flying paragliders in virtually every other country in the world. While a paraglider is not quite as fast in top speed as a hang glider, it is capable of soaring just as well and will usually outclimb a hang glider in thermal lift. 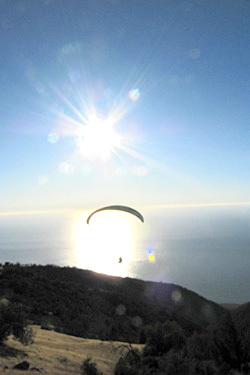 Modern paragliders have glide ratios of up to 11 to 1 and flights of up to 500 kilometers have been made on them.